Pets don’t have the privilege to communicate their thoughts or ailments which eventually make them more vulnerable to sufferings. As a pet owner, therefore, it is our responsibility to look after them and apprise ourselves of the health issues that are common in our furry Fidos. Most of these health problems are preventable when excessive care and treatment is provided to the pet. So, here is a list of common health ailments in dogs that you must know to prevent them successfully. These creepy little parasites are a host of many diseases in pets. They aren’t just annoying but are also transmitters of Bartonella virus, Flea Allergy Dermatitis, Tapeworms, Lyme Disease, Ehrlichiosis, Anaplasmosis and the list goes on. Prevention of these diseases is thus, extremely important to save your pet from a debilitating condition. Transmitted by mosquitoes, Heartworm is a deadly parasite that enters the heart and pulmonary arteries of the dog through the bloodstream. It then causes blockage of the vessels of heart and lungs potentially developing the risk of heart attack and lung dysfunction. Hundreds of worms can live in a dog and thrive for 5-7 years without getting noticed. Therefore, an annual blood test of a dog and preventives are mandatory to keep him safe. Arthritis is a common problem in older pets. This disease usually develops over time due to the wear and tear of the joints. Precisely speaking, the socket forming the joint loses its synovial fluid or in some cases the supporting cartilage withers off due to continuous pressure. It causes limping in pets and they may show reluctance towards physical activities. 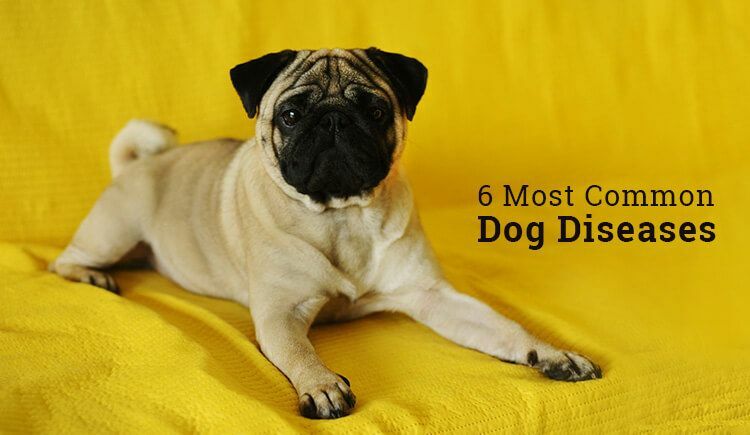 Dogs can easily develop plaque(yellowish-brown deposition) from the meals they eat which transform into tartar due to bacterial growth on the plaque. Tartar formation further leads to gum diseases and cavities in pets’ teeth often leading to heart and kidney failure when overlooked. Therefore, you must brush your pet’s teeth regularly and spray it with a plaque-clearing solution to keep his teeth and gums healthy. Many dogs do not produce insulin in their bodies or have inadequate levels that fail to break the food appropriately. This inefficiency or dearth in the body leads to elevation of blood sugar levels – a condition called hyperglycemia. If the condition is not controlled, it may emanate severe health problems in dogs. Dogs above ten years of age are at a higher risk of developing cancer. Many environmental and genetic factors play a prominent role in its development in dogs. Cancer has many forms out of which Lymphoma is one of the most common amongst dogs. Processed foods and ingestion of unwanted materials increase the chances of development of cancer in pets by multifold. Therefore, you must avoid them strictly. There are a plenty of other diseases that affect the pets, however, the aforementioned diseases are the most common and severely debilitating. Therefore, getting the correct knowledge about these common health problems and taking appropriate preventive measures is the only way to safeguard your dog completely.